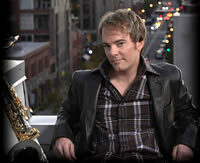 A master's level jazz graduate from the University of Northern Colorado, Canadian born saxophonist Darren Rahn is rapidly becoming a major player in the contemporary jazz genre. As an artist, he has recently scored two top five Billboard hits, including his #1 smash hit "Talk of the Town' which happens to be the title track of his latest CD. His current single "What Cha Gonna Do For Me" is already sitting in the Billboard top five and features the late, great Wayman Tisdale. Rahn and Tisdale are known for their many collaborations together, many of which have topped the Billboard charts. When asked about this particular collaboration, Rahn says of Tisdale, "Wayman was an incredible person and musician. I am so grateful that we were able to do this song together before his passing. We were both absolutely thrilled with the final result on this track. It was one of our favorite collaborations ever. I am excited to share this with others with hopes that it will highlight the legacy and genius of Wayman Tisdale. His gift and talent was larger than life, just like him!" Rahn began working behind the scenes in the mid-90s producing and programming tracks for other artists. It was his early work with Tisdale in 2004 on the 1 single, "Ain't No Stopping Us Now," that would bring Rahn to the forefront of the music industry. "Until my work with Wayman, I remained pretty much behind the scenes," said Rahn. Rahn continued to work in the studio with Tisdale and an assortment of other smooth jazz heavy hitters. These relationships would prove pivotal in the launching of his solo career and enabled him to quickly move from behind the console to the stage. By 2006, Rahn co-headlined in Catalina along-side Brian Culbertson and has toured with Tim Bowman, played with leading acts like Wayman Tisdale, Eric Darius, Kim Waters and Greg Karukus. In 2007, Rahn signed with nuGroove Records and released his debut CD, Once in a Lifetime. Integrating his solo career as an artist with his producer side is something Rahn consistently tries to keep balanced. However, Rahn is quick to admit that playing the saxophone remains his first love. "I was an artist before I was a producer. The producer thing just kind of happened," said Rahn. "Long before I was doing what I do now, I was playing the saxophone." Indeed, it was his early work on his debut CD, Once in a Lifetime, that caught the attention of many of the talented artists Rahn has now had the chance to work with. As an artist, Rahn constantly strives to raise the benchmark in his music. "I want to let the music and playing speak for itself. I want my playing to be timeless to stand the test of time," said Rahn. Creating his own sound is equally important. "The people that are successful really have a distinct sound. They have the ability to maintain a sustainable career," he said. Rahn believes that in order to be a successful performer, you must not only be original in your creative process but you must also pay close attention to the connection with the listening audience. "Music is not just for me. If a song was just for me, then I really don't see the point of recording it on an album. The reason for my playing is to reach out and share with people. I want to take what is in my heart and really connect with the audience," said Rahn. "I hope my music brings people happiness and is a positive force. I'm not the kind of guy that wants to sit around and do dark music. I want to do music that touches people and gives them a lift," he said. In an industry that is often more interested in the bottom line than artistic merit, Rahn has managed to remain strong in his desire to carve out his unique sound. Rahn has shown that it is possible to find a happy medium between commercialism and creativity. "Every time I write new music, I'm trying to break at least a little bit of new ground," said Rahn. "I know what's worked in the past and what people have enjoyed but I don't want to get stuck there," he said. Rahn stays up-to-date on industry trends but doesn't try to write specifically to fit the radio format. "I'm aware of what's working in the music industry but I don't write my material based on that. I write from my heart. Whatever is moving me at that moment is what dictates the outcome. I let my heart lead the way but I also use what I've gleaned from the industry. The trick is to make sure everything is done to best serve the art," said Rahn. Although he continues to break new ground and redefine the landscape of contemporary jazz, this young lion doesn't consider himself a pioneer. "There are many great pioneers in this genre that have come before me. I've certainly learned from them. I have no doubt guys like Jeff Lorber, Grover Washington, Jr. and David Sanborn have been pioneers," said Rahn. "There are a lot of changes in the industry right now and I'm part of those changes, but I certainly wouldn't consider myself a pioneer. I'm not pretentious or presumptuous about what I've done or am going to do. I'm just happy about doing what I love," he said. 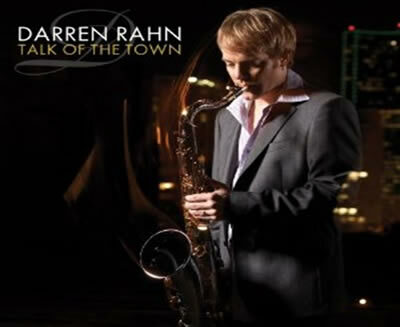 Recently released on NuGroove Records, Darren's new album "Talk of the Town" features the industry's top session players and includes thoughtful collaborations with Bob James, Jeff Lorber, Wayman Tisdale, Tim Bowman and others.